Short of appearing in person in an emergency situation, some sort of communications interface will exist between a patient and their healthcare provider. Such communications will span the gamut from efficient live telephone answering during normal office hours by a regular doctor's employee... to seemingly endless on-hold delays with an overworked live attendant after hours... to poor quality voice mail applications... to fully capable call center solutions. 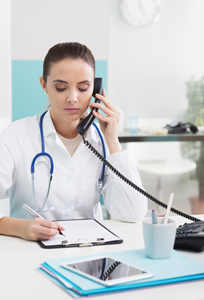 Back in 2006, a study appeared in the Journal of the American Board of Family Medicine entitled "Harm Resulting from Inappropriate Telephone Triage in Primary Care." The abstracted conclusion: "Harm may occur when patients' calls are not forwarded to the on-call physician. Although the level of harm is generally temporary and minimal, the potential exists for serious harm to occur. Physicians need to re-evaluate the way they handle after-hours calls." "While we found only about 1 percent of the patients making an after-hours clinical call suffered harm or discomfort, this is a 2500-fold higher rate than is considered acceptable by other industries. When considering patients who experienced harm or additional pain and suffering, we believe that it is necessary to rethink what is an acceptable barrier to after-hours communication between patients and physicians." Bear in mind that this study covered only primary care, in a single geographic area (Denver, CO). Fast forwarding to 2016, we offer a helpful infographic with the provocative title "Is your medical call service is as good as you think?" Among other things, the clear distinction is made between a "dumb system" and an "intelligent system." From the patient's point of view, a dumb system comprises non-expert call pickups after multiple rings before being answered, with uncertain outcomes; while an intelligent system features an answer within three seconds, quick triaging of every call, and speedy, sophisticated doctor access. With an intelligent answering service the emphasis is on personalization; which is to say, in a world of impersonal bureaucracy—in a field overrun by numbers, in lieu of names and faces—it pays to have a HIPAA Privacy-compliant team with the training and enthusiasm necessary to handle medical emergencies, and to do so (for issues of major or minor concern) in both English and Spanish. No time like the present to upgrade our medical communications first responders.